Juventus vs Atletico Madrid Live streaming: Juventus are trailing 2-0 and need to score at least three goals to avoid penalties and go through to the quarter-finals. 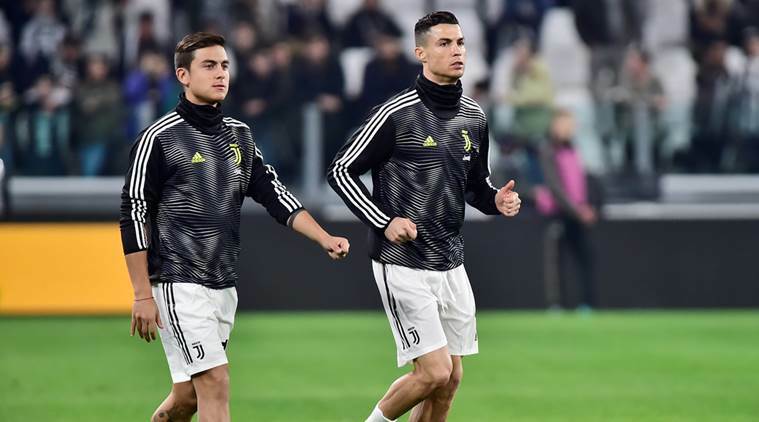 Juventus vs Atletico Madrid Live streaming: Paulo Dybala and Cristiano Ronaldo will have to provide the goods as Juventus go looking for goals. Juventus vs Atletico Madrid Champions League Football Live Streaming: Those who were not introduced to Juventus by Cristiano Ronaldo this season would be well aware that the Italian giants built their stock on their ever dependable defence and pragmatic approach in big matches. Diego Simeone also built Atletico Madrid on these principles and transformed them from being a mid-table club in La Liga to one that broke the Real Madrid-Barcelona duopoly and kept punching above their weight in the Champions League. In the first leg of their Round of 16 clash, the two sides clashed and Juventus came out of it two goals down. Those goals didn’t come from slick open play, they were set piece goals, scored by centre-backs Jose Gimenez and Diego Godin. Juventus’ defence stood strong throughout but the set-piece gave them away. Atletico’s defence stood strong strong, set-piece or otherwise. It will be another clash of defences but Juventus have the task of scoring at least three to give their back line something to work on. When is the Champions League Round of 16 second leg between Juventus and Atletico Madrid? The Round of 16 match between Manchester United and PSG is scheduled for kick off on early Wednesday morning in Indian time. What time is the kickoff scheduled for the Champions League Round of 16 match between Juventus and Atletico Madrid? The kickoff for Champions League Round of 16 match between Juventus and Atletico Madrid is scheduled at 1:30 AM IST. Where is the Champions League Round of 16 match between Juventus and Atletico Madrid being played? The Champions League Round of 16 match between Juventus and Atletico Madrid is being played at the Juventus stadium in Turin, Italy. Which channel will air the Champions League Round of 16 match between Juventus and Atletico Madrid? The Champions League Round of 16 match between Juventus and Atletico Madrid will be broadcast on Sony Ten 2 and Sony Ten 2 HD. How do I live stream the Champions League Round of 16 match between Juventus and Atletico Madrid? Champions League Round of 16 match between Juventus and Atletico Madrid can be followed live on Sony Liv.